1 . 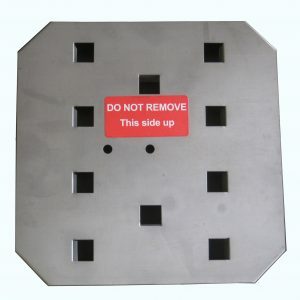 Make sure the PP101 Protector Plate is in place. This is necessary for proper suction. Upon receiving your vacuum system, lift off the lid. The protector plate should be located inside the can just below the HEPA bag. The protector plate is installed correctly when it lays fl at, prong side down, directly under the HEPA bag. The warning label should be facing up. The plate provides a barrier between the HEPA bag and mesh screen. This allows air to circulate preventing the motor from overheating. Do not to throw this part away. 2 . 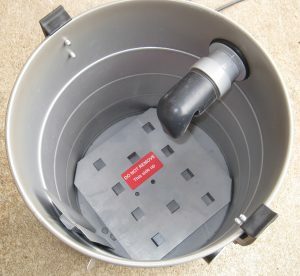 Install the HEPA bag onto the inlet inside the canister. 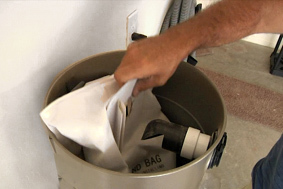 First, take the bag and fully expand it.Then place it in the canister and slide its gasket onto the inlet stem until it drops into place in the ridge that is around the inlet stem. Replace the lid onto the dirt canister and ensure that it seals properly. 3. You will need to attach the curved wand to the hose. 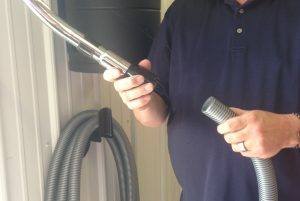 To do so, you will twist the wand to the LEFT as you thread it onto the hose. Note: This is the opposite direction of typical threading. REMINDER: This is not a wet pickup and cannot be used with liquid. Doing so will void warranty.